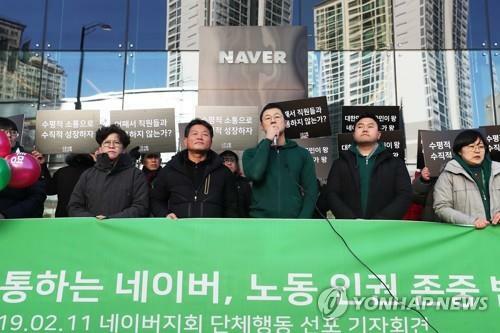 SEOUL, Feb. 11 (Yonhap) -- The labor union at Naver Corp., South Korea's dominant Internet portal and search engine, said Monday that it will have no choice but to consider a strike if the company does not engage in meaningful dialogue. The union, which was established in April 2018, has warned it could take collective action as the negotiations with the management broke down after rounds of talks. "We will have no choice but to consider taking the most powerful collective action possible if the company maintains the attitude of ignoring the three primary rights of workers," Oh Se-yoon, head of the Naver's union, told reporters at the company's headquarters in Pangyo, south of Seoul. The three rights are the rights to independent association, collective bargaining and collective action. The union said it plans to take the first collective action on Feb. 22, claiming negotiations collapsed because management did not agree to a tentative agreement. Under the agreement, the company would have been obliged to provide 15 days of holiday in a sabbatical year and 10 days of paid paternity leave for male workers. The union is the first since Naver -- which has nearly 4,000 employees including its affiliates -- was established in 1999. About 40 percent of Naver workers have reportedly joined the union.